Welcome to our New SABC Corporate Member! We welcome Bellecapital and its Executive Director Thomas Fritz as a new Corporate Member. Headquartered in Zurich, Switzerland, Bellecapital is one of the largest independent Swiss asset management firms providing performance oriented investment management services to wealthy individuals, families and endowments. Bellecapital International (BCI) is a wholly-owned subsidiary of Bellecapital Holding. 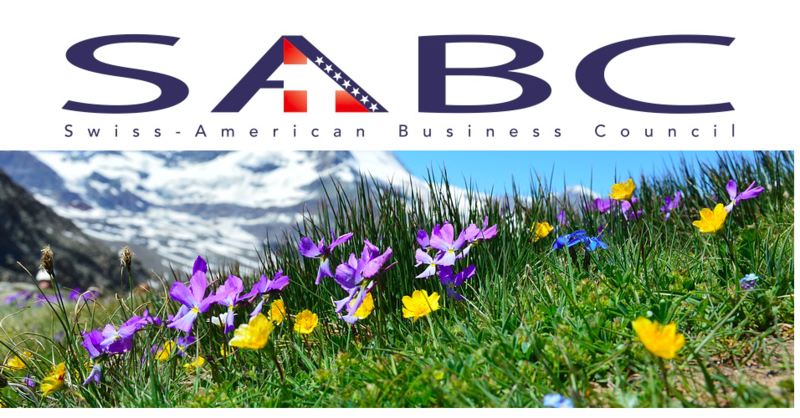 BCI is registered as an Investment Adviser with the U.S. Securities and Exchange Commission (SEC) and one of the largest independent Swiss asset management firms specifically established to meet the legal and regulatory requirements of investors who are U.S. citizens and residents. Clients benefit from BCI’s outstanding investment advice as the firm is acting independently from any custodian bank and has distinguished capabilities in managing Swiss and European equities. Mid-America Club 200 E. Randolph St. 80th Floor, Chicago. Please join the Swiss American business and civic community in Chicago for cocktails and hors d’oeuvres with a spectacular view to celebrate Swiss National Day! 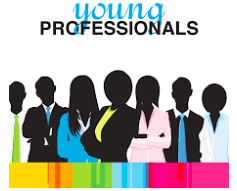 During the Young Professionals Meeting Bjorn Schwarzenbach from Rollomatic Inc will give us a presentation on the current state of advanced manufacturing in the US and new technologies alongside IoT trends. Rollomatic is a Swiss machining tool manufacturer with US headquarters in Mundelein, IL and has been a long-time corporate member of the SABC. 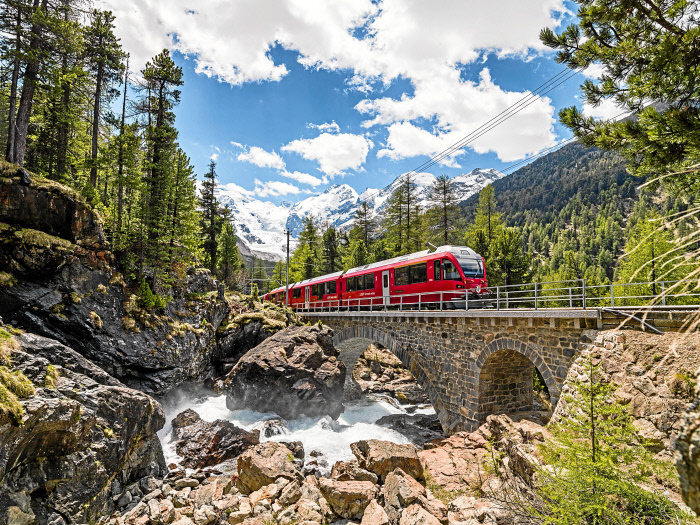 The following Swiss National Day Reception, provides an opportunity for young professionals from the Swiss-American community to connect and to give young professionals the option to network with more senior professionals from the Swiss-American business, scientific and cultural community. Free of charge to attend. 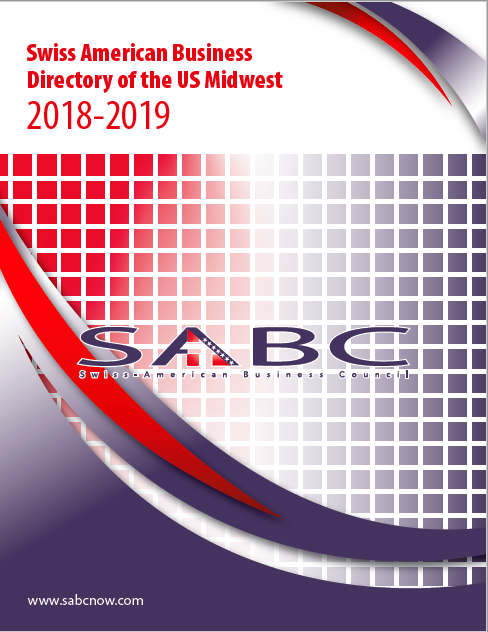 We are proud to announce the new edition of the SABC Business Directory of the US Midwest, the leading resource of Swiss business interests in the Chicagoland area. It is available online, and there is a limited amount of printed copies available. 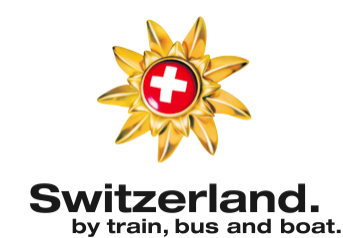 Swiss National Day Celebration 2018 – July 28th @ 4:00 pm - 9:00 pm. Brat- and Knackwurst, various salads, breads and a variety of famous Regional Swiss cakes for dessert. On May 8, President Trump announced the U.S. withdrawal from the Iran nuclear deal (the Joint Comprehensive Plan of Action or JCPOA), starting a countdown on the re-imposition of certain Iranian sanctions waived by the U.S. in January 2016. The U.S. Departments of State and Treasury have established 90-day and 180-day wind-down periods for certain transactions involving Iran. The U.S. Treasury Department’s Office of Foreign Assets Control (OFAC) has released guidance regarding the re-imposition of sanctions. Barnes & Thornburg’s Global Services Group counsels Swiss and other European entities engaged in business in the United States in corporate, immigration, regulatory, intellectual property and other legal matters. Our clients gain access to more than 600 legal professionals throughout 14 offices across the country. 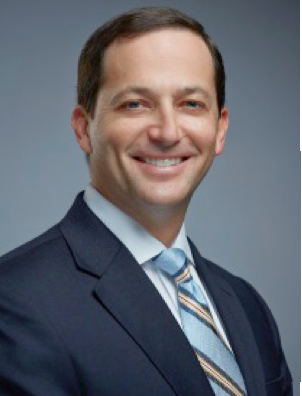 We are among the 100 largest U.S. firms and have experience in virtually all the legal practice areas required to do business in the U.S.
SABC board member Will Turner has more than 20 years advising domestic and international companies in a wide range of industries on U.S. commercial and transactional matters. 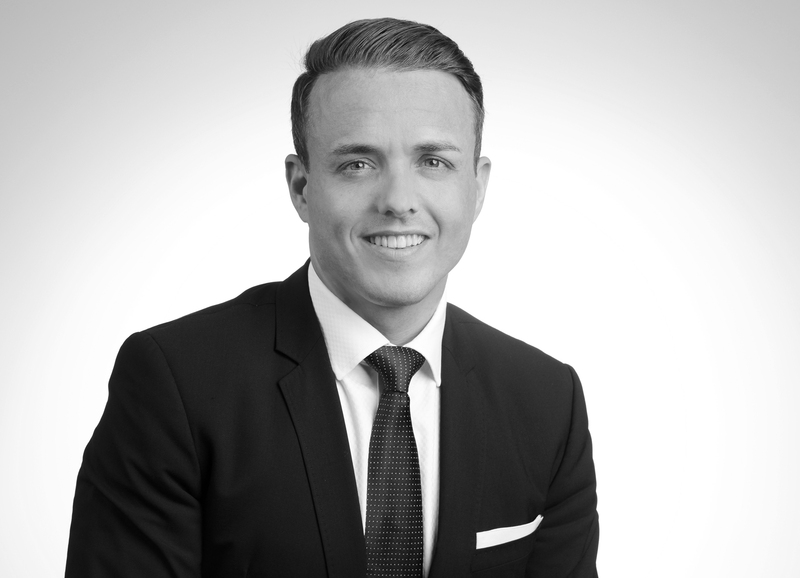 If you have questions about CFIUS risk in potential U.S. transactions, please contact Will Turner. Fracht USA has enjoyed tremendous growth in recent years. We now have nine offices and three sister companies in the US. We have doubled our staff in just the last 6 years to over 200 valuable and customer focused employees. Mr. Etienne Seiler (CEO) and Mr. Reiner Wiederkehr (COO) coupled with a great US management team and dedicated staff have been leading the charge to this tremendous success. Now there will be some reorganization and Mr. Seiler (CEO) will start the process of turning over this successful organization to Reiner who will become the new CEO of Fracht USA effective July 1, 2018. Mr. Seiler will remain president and focus more on the financial side of Fracht USA. We are very excited about the past and future of this great organization and the leadership we have in place. Thank you both – and no doubt we will continue to grow with the most important item – the support from our clients – current and future ones. 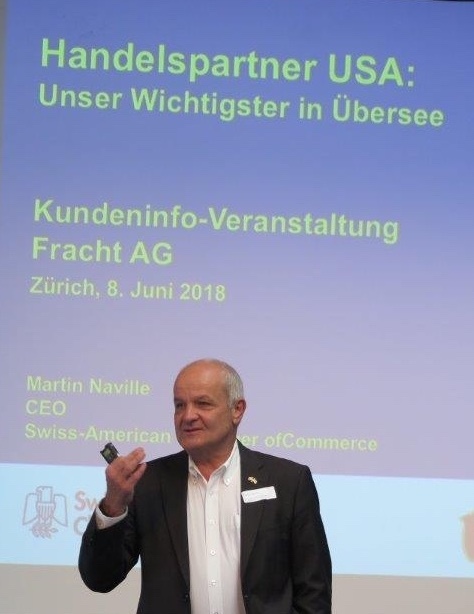 Mr. Etienne Seiler organized an annual customer event in Switzerland where he touched on current challenges on the US Transportation market. We had the pleasure to welcome Mr. Martin Naville – CEO of the Swiss American Chamber of Commerceas a keynote speaker. The 75 guests in the audience with a great interest in the US market were all anxious to hear the views of Mr. Naville and Mr. Seiler. Despite the current noise…..GO FOR THE US MARKET! YES – go for the US Market ….AND WE RECOMMEND TO DO IT WITH FRACHT! Students from James B Conant High School enjoyed a front-row seat at the Indianapolis Motor Speedway during the final day of practice for the 2018 Indianapolis 500. 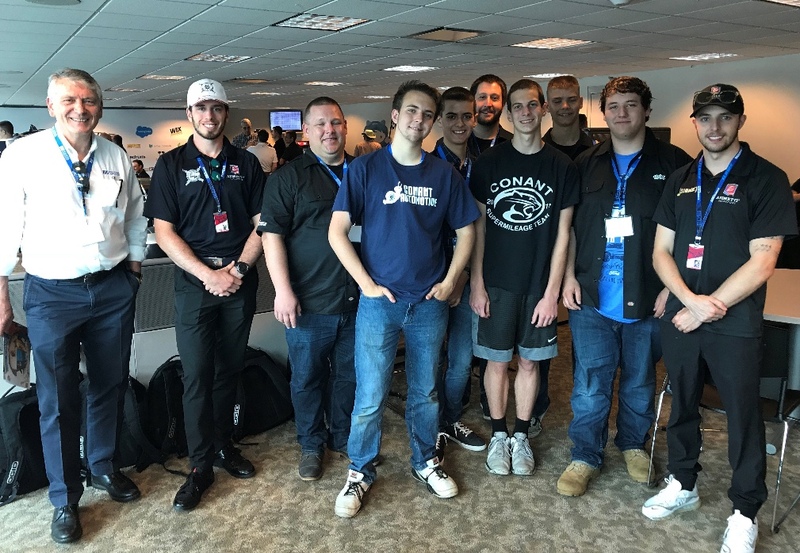 The 10 students and instructors were hosted by BIG KAISER, a technical sponsor for Andretti Autosport in the Verizon Indycar Series. The students earned the VIP trip to Indianapolis after winning their own race in the Illinois Energy Efficient Vehicle Competition on April 30th in Joliet. For this competition, high school students put STEM lessons into practice by designing, building and driving an energy-efficient vehicle. Instead of racing for speed, they are competing for maximum distance on a single gallon of fuel, and winning teams routinely surpass 500 mpg! The excursion to Indianapolis started at the Andretti Autosport race shop, followed by a guided tour at the IMS Museum, and then lunch in a private suite during practice rounds at the Indianapolis Motor Speedway. “It was really great to see the enthusiasm of the kids during the tours and when they met some of the Andretti team drivers at the track,” said BIG KAISER President/CEO, Chris Kaiser. Programs like the Illinois Energy Efficient Vehicle Competition are designed to promote manufacturing education and technology-related careers to high school students. BIG KAISER is a worldwide leader in high-precision tooling systems and solutions for the metal cutting industry. 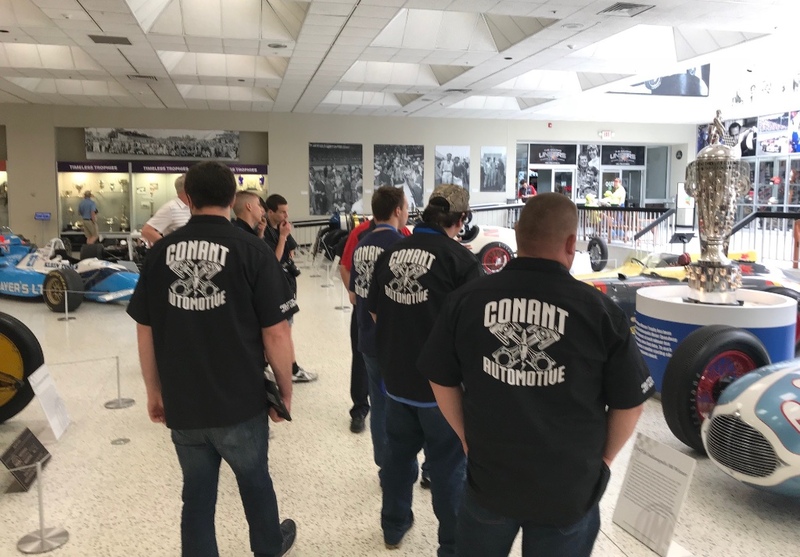 The company is a strong supporter of manufacturing education and workforce development, and also sponsored the inaugural Illinois Energy Efficient Vehicle Competition in 2017. HEULE Tool Corporation in Loveland, OH recently celebrated their 30th anniversary serving manufacturers in North America. HTC was established in 1988 by HEULE Werkzeug AG in Balgach, Switzerland and was first located in West Plymouth, MI. 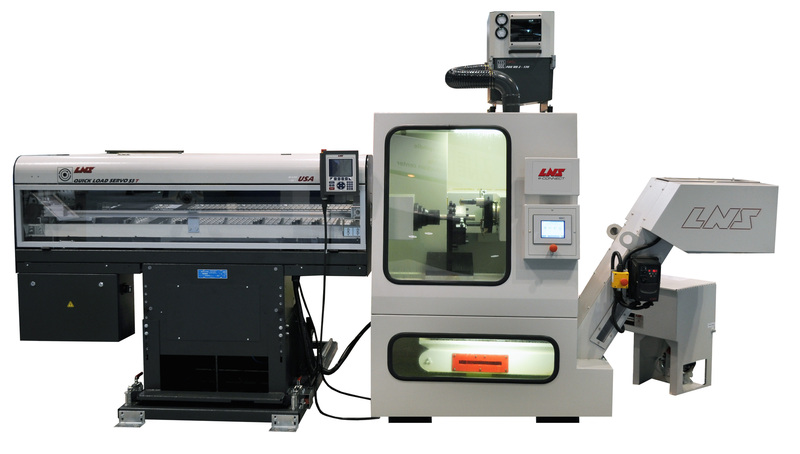 Moving to the Cincinnati area in 1993, HTC has continued to increase sales of their automated deburring, chamfering, countersinking, and spotfacing tools in the U.S., Canada, and Mexico and is now widely used by leading high-volume manufacturers for their Swiss-made precision cutting tools. “Our customers in North America appreciate the high-quality product that the Swiss make,” said HTC President Gary Brown, speaking at the 30th Anniversary Open House. Brown, who has been leading HTC for 29 of the 30 years, thanked HEULE Werkzeug AG CEO Ulf Heule, who was present at the event. He also recognized Ulf’s father, Heinrich, who invented the first automated deburring tool in 1961 and launched the company. “We couldn’t be here without you,” Brown said. Ulf Heule also spoke at the event, thanking HTC employees for their hard work in making HEULE successful in North America. “Today HTC is an important part of the HEULE group, “Said Heule, who also supports subsidiaries in Germany, China, and South Korea. HTC celebrated their anniversary on April 25, 2018 by inviting their local sales agents, distributors, customers, government officials, business partners, friends and family to an open house and pig roast where they toasted to HTC’s success. Ulf Heule and Gary Brown also planted a tree on the grounds of HTC to commemorate 30 years of growth in North America. Heule Tool Corporation is the North American subsidiary of Heule Werkzeug AG which was founded in Balgach, Switzerland in 1961. 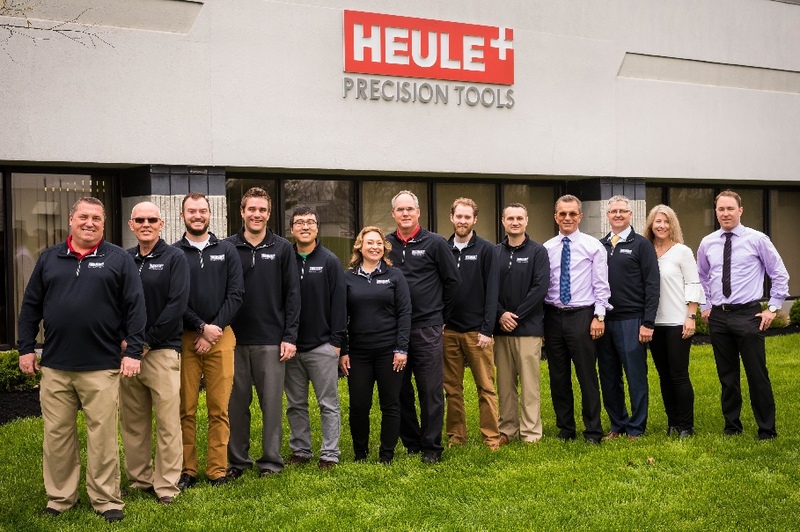 Based in Loveland, Ohio, HEULE Tool Corporation serves manufacturing leaders throughout the US, Canada, and Mexico by providing Swiss-made precision tools designed for efficient front and back deburring, chamfering, countersinking, counterboring, and spotfacing. HEULE is dedicated to helping high-volume manufacturers across all industries to reduce cycle times, cut production costs, and produce higher quality parts off the machine by utilizing automated tools. Rollolmatic will premiere the new GrindSmart® 830X CNC tool grinding machine at this year’s upcoming International Manufacturing Technology Show (IMTS 2018) in Chicago, IL. 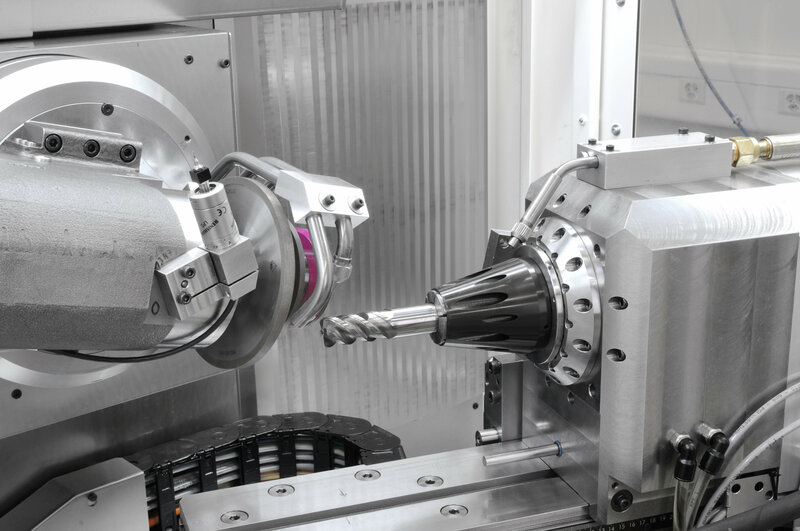 Integrating the innovative combination of Hydrostatic technology and linear motors, the new 6-axis model has been developed specifically to produce both large & small tools for superior surface finish & cutting edges. Hydrostatic technology uses an oil film under pressure between the rails and are self-compensating for temperature. The oil flow is under a constant closed loop control, allowing the system to also compensate for changes in the thickness of the oil film. 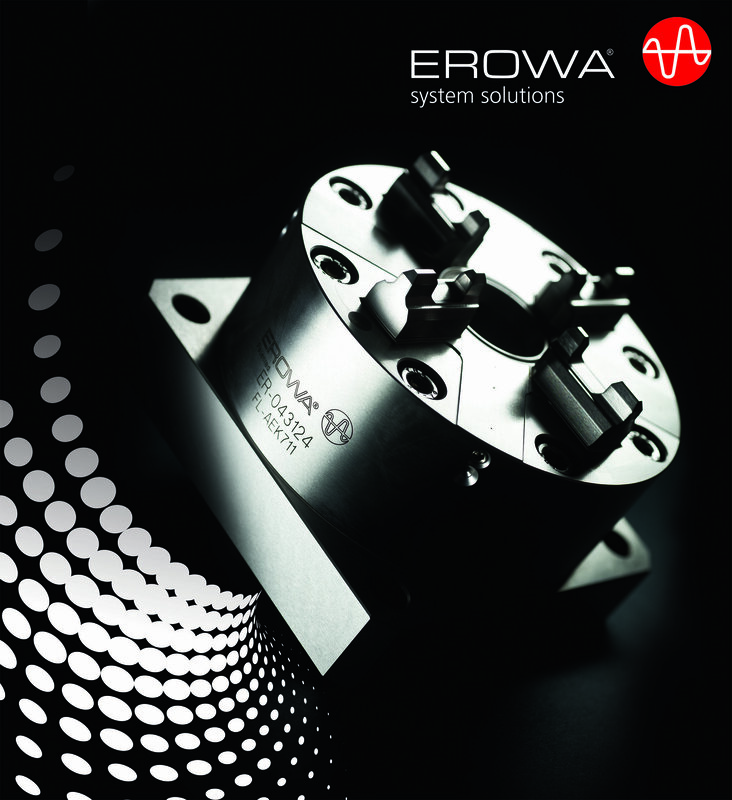 This allows for vibrations to be zeroed out for better tool quality on the micron level. Combined with Rollomatic SmartFactory software for Industry 4.0 integration such as RConnect & RMonitor, new machine connectivity will allow manufacturers call up the status of a grinding machine while it is in operation, ensuring production is running smoothly from any computer connected to the Internet or company network. Visit the Rollomatic Group in Booth #237200. For more information on turn-key precision tool grinding centers from Rollomatic, contact us at www.RollomaticUSA.comor email us at solutions@RollomaticUSA.com. You can also follow us on LinkedIn,Facebook, orTwitter. Visit regularly: ask about phone calls received and watch for a full mailbox. Consider changing their phone number to prevent con artists from pursuing fraudulent activity. Guard the mail and trash: Deposit outgoing mail in collection boxes or at the post office. Open a post office box for incoming mail. Shred personal documents. Set up automatic bill payments: Suggest establishing automatic online bill payments and check deposits. Having a centralized system for incoming and outgoing money will protect them from potential fraud, and ensure bills are paid on time. Inventory key documents: It is important to know where all the important documents are kept. This includes documents associated with investments, benefits, expenses, and legal documents. Use the National Do Not Call Registry: Call 888-382-1222 or visit donotcall.gov to limit calls from telemarketers. Discuss hazards: Tell your loved one that it is never a good idea to divulge personal information. Advanced protection strategies: Family members and caregivers must plan ahead for a time when a love one will no longer be able to make decisions. Delegate financial decision-making and establish trusts before serious problems surface. We would like to announce that effective July 2nd, 2018, Zachary Smith will assume the position of Midwest Regional Sales Manager for Wandfluh of America, Inc.
Zachary studied Business Administration at Youngstown State University in Ohio and has received his Certification as a Fluid Power Hydraulic Specialist. Zachary has worked in the fluid power industry for the past seven (7) years in various capacities as a hydraulic technician and assistant branch manager with Linde Hydraulics in Canfield, Ohio; an Inside Sales Account Manager with SunSource Hydraulics in Chicago; and most recently as an Sales Account Manager with Catching Fluid Power/Kaman Industrial Technologies developing new business through direct OEM and distribution accounts within the Chicago metro area. Zachary lives in Chicago (Old Irving Park) with his finance Crystal and their two dogs, Gonzo and Bear. Zachary enjoys traveling, and outdoor sports such as golf, biking, and hiking when time permits. Please join us in welcoming Zachary to the Wandfluh family and organization, and lending your suppoprt to him for his continued success. 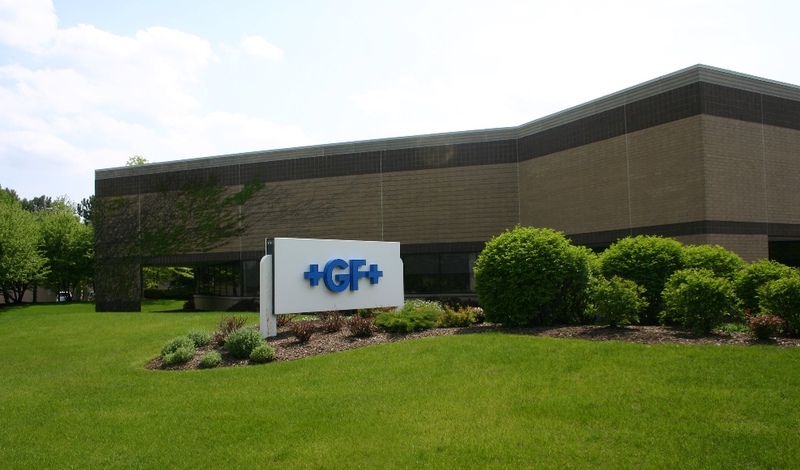 GF Machining Solutions is the world’s leading provider of machines, diverse technical solutions and services not only to the tool and mold making industry but also to manufacturers of precision components. 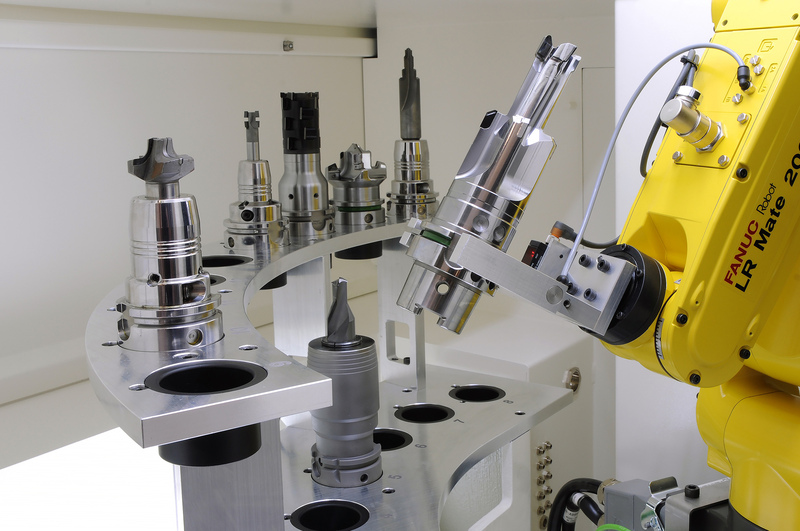 The portfolio ranges from electrical discharge machines, high-speed and high-performance Milling machines—including clamping and palletization systems, 3D Laser surface texturing machines and Spindles—to solutions for Tooling and Automation, services, spare parts, expendable parts, consumables and Digitalization solutions. GF Machining Solutions is a globally acting Division of the Georg Fischer Group (Switzerland) and maintains a presence on 50 sites worldwide within its own organization. 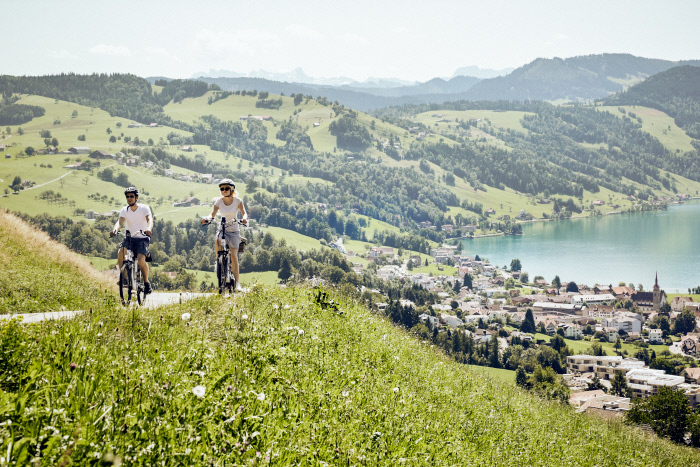 Its 3,255 employees generated sales of CHF 992 million in 2017. More information can be found at www.gfms.com/us.